Maharashtra National Law University Mumbai has been established under the Maharashtra Act No. VI of 2014 on 20th March 2014. The University endeavours for the development and advancement of legal education and for the purposes of imparting specialized and systematic instruction, training and research in systems of law and for the matters connected therewith or incidental thereto. 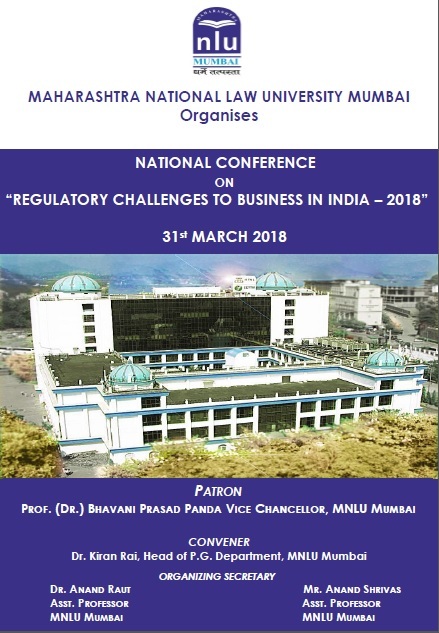 The University invites you/your institution to participate in National Conference being organised by MNLU Mumbai on “Regulatory Challenges to Business in India – 2018” on March 31st, 2018. The conference has been organised with an aim to offer one-of-a-kind opportunity for intellectual deliberations and brainstorming on regulatory challenges/hurdles faced by businesses in India. This conference would see active participation of Academia and Professionals and provide a platform to discuss troublesome regulatory endeavour faced by industry and businesses during this period of unprecedented economic liberation and suggested remedies to overcome them. Participants, whose abstracts would be selected, have to register online alongwith making full payment. In case of more than one author, all the co- authors have to register separately. After registration, participants shall write a mail to [email protected] with subject ‘Registration and Payment Details’. The mails hall include Registration and Payment Details, Request for accommodation (If required) and payment details for the same alongwith subsequent proof(s) of payment. On the spot registration is also available for authors whose abstracts have been selected.